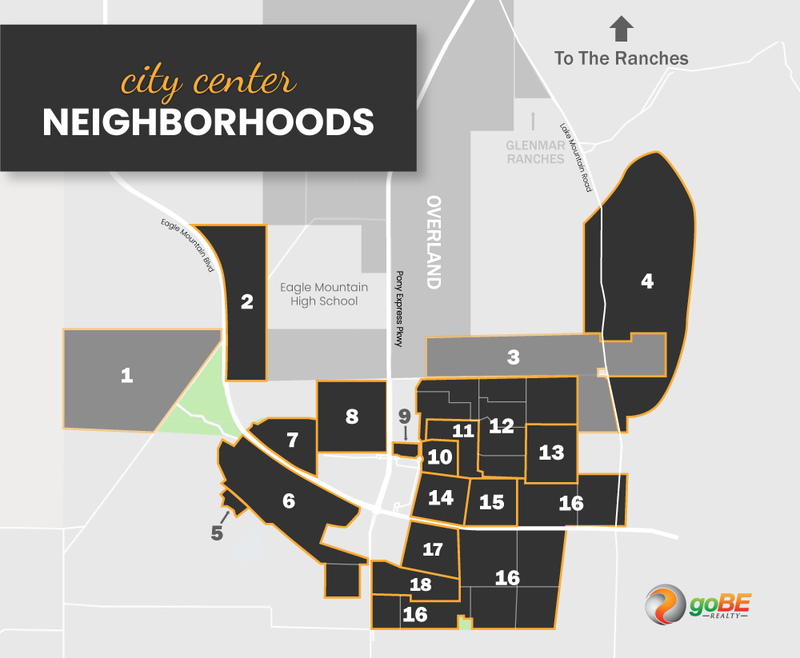 The City Center at Eagle Mountain has 18 neighborhoods—each with distinctive characteristics. Using the below map, you can find info for each of these neighborhoods and the homes that are currently for sale. At the bottom of this page, you will find sections that detail the following—single family home neighborhoods and townhome neighborhoods. Additionally, we've created lists for the most popular areas at City Center and new construction neighborhoods. Sage Park - New construction right next to the future Eagle Mountain High School. Overland Trails - Large lots and beautiful ranch-style homes. Eagle Park - Affordable single-family homes with a fun park in the middle of the neighborhood. Colonial Park - The most affordable new-construction homes in Eagle Mountain! Pioneer - The heart and largest neighborhood of City Center. Eagle Point - Southernmost neighborhood of new construction and existing single-family homes.